Fruit-forward and smooth with hints of cherry, blueberry and red fruit. Off-dry with fruity notes on the palate accented by cherry and vanilla. Food-friendly and perfect for everyday enjoyment. Established in 1999 by Craig and Vicki Leuthold as one of only 100 wineries in the state, Maryhill Winery is now the 10th largest winery in Washington, producing 80,000 cases annually. Nestled among rows of vines along the stunning Columbia River in Goldendale, Wash., Maryhill is a popular destination for wine tastings, tours and special events, with an adjacent 4,000-seat outdoor amphitheater that hosts a world-class summer concert series and free live music on the vine-covered terrace every summer weekend (Memorial Day – September). Maryhill’s 3,000 sq. ft. tasting room and 1,200 sq. ft. Reserve Room draw more than 75,000 wine enthusiasts from around the globe each year, ranking among the top five most visited wineries in the state. Maryhill sources more than 30 different varietals of grapes from some of the most highly-regarded vineyards in the state, over 50 different wines, and has claimed more than 3,000 awards since its first vintage in 2001, including the “2015 Pacific Northwest Winery of the Year” award by Wine Press Northwest, “2014 Winery of the Year” by San Francisco International Wine Competition, and “2013 Winemaker of the Year” by Indy International Wine Competition, and “Best Destination Winery” by Seattle Magazine. The winery has a 2,000+ member wine club and is distributed across the United States. No brainer auto-buy. This is liquid gold as an everyday drinker; in for at least a case. @Allieroon Any chance you could elaborate? Tasting notes on the 2014 are per the description above but I would also add a bit of sour cherry/pomegranate, medium bodied with a smooth finish leaving traces of slight smoke, espresso, and cedar. I had cases of the last two vintages, no notes, but they’re all gone! As an everyday drinker, it goes quickly in our house…especially if guests are involved; everyone raves about it! Value is tremendous at this price point. One of our local grocery stores has it on sale now direct from the winery for $9.99/bottle…they can’t keep it stocked. Perfect food wine…from burgers and pizza to a nice cut of meat on the bbq, you can’t go wrong. Hope that was more helpful than my original two liner! @Allieroon @rlmanzo I’m jealous of your proximity to Maryhill! I couldn’t say it better myself! Maryhill is a quality winery, in both destination for a visit, and their products. This is from their value side of their repertoire, but no slouch of an offering by any means. Instantly in for a case. I just wanted to verify no shipping to MO? Maryhill’s website says they can ship to MO. Thanks! @chemvictim ditto for CT. I didn’t go through the full check-out process but it appears to be accepting my address. @chemvictim @normanl0 @winer We’re checking with the winery, since this is the list they sent us. Will hopefully have an answer soon! @chemvictim @normanl0 @winer Unfortunately Maryhill confirms that unfortunately MO and CT are not on the table at present. 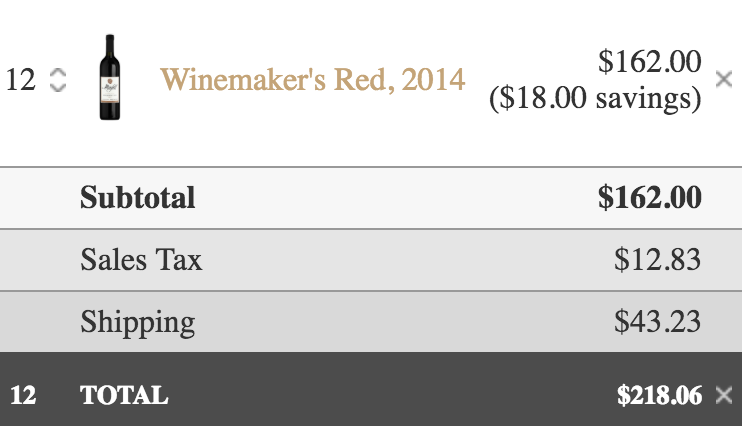 Wine.woot sold a 6-pack of the 2013 vintage last September, for $60. I’ve tried one, it was enjoyable. Any lab rats? I’d love to see a compare/contrast. I just lit up Illinois. @InFrom same here I bought the wine.woot offering and each time we opened a bottle with friends, they were pleased, as were we. If the 2014 is similar to 2013, this is a very intriguing wine and truly enjoyable. At this price, it is a steal and an autobuy. Had the 2013 from Woot as well. No notes but I do remember thinking the wine represented very good value. No reason to not buy this vintage as well in my opinion. Maryhill wines are already a good value at retail price, so the Casemates deal makes this a very attractive offer. I have also had a previous vintage (2012) and found it to be a solid red blend. I was a member of this winery for years. This wine is good value as an every day drinker. No notes, but I’m likely in for a case at this price. I’ll grab a case. Sounds like a solid red blend. First purchase in a few months. Getting low on daily drinkers, in for a case. Good but drink within two years. I like this winery and have even visited. Nonetheless, I had some 2013 Winemakers Red from woot that I just opened and two of them had turned. I’ll admit storage was sub-optimal. @wistungsten Similar story here. I opened my last bottle last week and it was fizzy. Otherwise I enjoyed the other 5 bottles. @wistungsten I ordered a case of the 2013 from woot. Had one last week, first one in awhile, it was fizzy, off, bad. One bottle left, sounds like a theme. @kaolis @wistungsten Yeah, looking at my CT notes from the 2013 bottle I opened not long ago, the wine was fine, with a slight fizz. So drink up! N.B. My storage was optimal, if one can call dwelling for close to a year in a drawer of my office file cabinet optimal. Anyone around NYC want to split a case? I’d take six. Hi, tried our first bottle last night. It was ok but we had some round crystallized goodies in the bottle that weren’t that appealing. Anyone else had any issues? Tartrate crystals. It just means that the wine wasn’t cold-stabilized, IIRC. They are harmless and shouldn’t affect the taste of the wine. just wondering if anyone else has had any problems with the corks. i bought a case and i just opened bottle #5 and every one of them has given me issues. i get them out a third at a time and even had to throw a bottle away because the cork broke into pieces and fell into the bottle. Get yourself one of these and you’ll never have to throw a bottle away for that reason again. You will also be able to enjoy bottles with sediment without having to decant, which is mostly why I use it. @chipgreen @rockme513 Listen to him. He actually gave me one when I poured a madeira at one of the RPM tours, and it is great! I used an Ah So puller and the cork came out just fine.